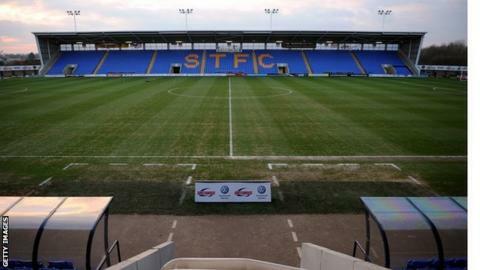 Shrewsbury Town's board have promised a "root and branch" review now relegation to League Two is all but confirmed. The Shrews, who are second-bottom in League One, must win their remaining two games to have any chance of avoiding the drop. Shrewsbury boss Mike Jackson's future is unclear as he was appointed until the end of the season in February. "We wish to apologise for this season's results. They have been unacceptable," a board statement said. "We are undertaking a root and branch review of our entire footballing structure." Jackson, 40, recently hinted that a number of off-field issues had hampered their fight for survival. The board said this season's problems stem from the end of the 2012-13 campaign. "The main problem was a very poor close season when many of the transfer targets didn't come off," the statement added. "That left us with a small squad with the result that we were over-reliant on the loan system." Shrewsbury have used 39 players this season, including 20 loanees and that, according to the board, made trying to build team spirit and consistency on the field "virtually impossible". The board also cited the cost of bringing in loan players as proof that the accusation of not investing enough in the club was false. "We believe we have supplied competitive budgets to cement ourselves as a League One club with aspirations of the play-offs," the statement added. "There would have been funds available if the right player was available." The impact made by the club's home-grown players this season was highlighted as a positive with the pledge that they will play a bit part in the club's long-term future. "Recruitment at all levels will be made and a playing style will be engendered throughout the club with the aim to create a winning mentality at all levels," the board added. "Once again we apologise for the season and reassure supporters that we, as a board, have reviewed the mistakes made." Shrewsbury take on Peterborough in their final home game of the season knowing anything other than victory would condemn them to League Two.